Most Wisconsin waters are safe for pets to swim and play in, but the Wisconsin Department of Natural Resources (DNR) advises to avoid water with a surface scum or mat of algae. Blue-green algae is in full bloom because of the high temperatures. Be sure you are taking the right preventative measures to protect your companion. 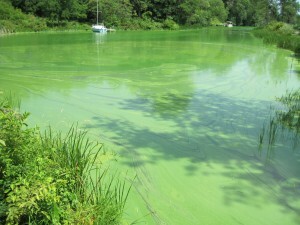 According to the DNR, Blue-green algae generally grow in lakes, ponds, and slow-moving streams when the water is warm and enriched with nutrients like phosphorus or nitrogen, the water will look like pea soup. Blue-green algae are most often blue-green in color, but can also be blue, green, reddish-purple, or brown. If your pets go into algae cloaked water be sure to use clean water to remove algae from their fur as soon as possible, and provide clean water to drink as well. Your companion has a higher risk of death from the toxins. If your pet ingests large amounts of algae or lick algae from their fur contact your veterinarian immediately. Report a Case with potential health effects caused by blue-green algae, visit the Department of Health Services, or contact the Bureau of Environmental and Occupational Health at 608-266-1120.